In Zamfara State years of unrest have claimed thousands of lives and driven whole communities into destitution. 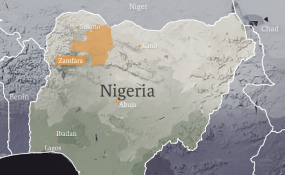 The Nigerian government has defended its decision to ban mining activities in Zamfara and to expel foreigners involved in the activities in the area. The government on Monday gave the foreigners 48 hours to leave the country. Speaking on the development on Monday, the Minister of Mines and Steel Development, Abubakar Bwari, said although boosting the economy is paramount, protecting human lives is key. Mr Bwari spoke in Kuchiko, Suleja, in Niger State at the ground-breaking ceremony of a project for the exploration of solid minerals such as gold and platinum. "While we pursue economic activities, we should also consider the human side of it, the loss of lives we are witnessing. The message to our investors and those would-be investors is that this would not take a long time to be resolved." The government announced the ban on mining activities as part of measures to restore peace in Zamfara State where bandits have killed hundreds of persons and kidnapped several others for ransom in recent months. Mr Bwari said legitimate mining activities have been put on hold in the state for over two years due to banditry activities. "Mining activities have been disrupted even before now, those doing legitimate mining stopped mining in Zamfara two years ago as a result of banditry and criminal activities." He assured Nigerians that the security agencies were working hard to curtail the menance. The minister said the ground-breaking ceremony was aimed at addressing one of the key challenges in the solid minerals sector. "No investor would take us serious if we are unable to provide a verifiable data to speak for both quality and quantity of the minerals we have. "The project is part of the National Integrated Mineral Exploration Project(NIMEP), which is costing the government N15 billion, making it the biggest of its kind ever embarked upon by this country. "This again demonstrates the seriousness with which the government of President Muhammadu Buhari is pursuing the agenda of diversifying the economy, using the solid minerals sector." Mr Bwari said with this project, youth would be engaged in mining activities, giving room for employment. The project supervisor from Nigeria Geological Survey Agency, Kaka Imam, said NGSA is the liaison between the contractor and the government. According to him, five companies in states like Niger, Osun, Oyo, Kebbi, Zamfara and the Federal Capital Territory(FCT) are working on this project, having AG VISION as the base. "What we do on the field is to carry out geological mapping, geochemical mapping and sampling, ground geophysical survey, drill for samples, analyse all samples collected, integrate all data, produce maps and the models and do a resource evaluation (mineral reserve)." The NGSA are providers of background information. They also ensure proper management of the project. Mr Imam said as the supervisor, he would provide periodic reports which could be two to three months and cover all stages of the exploration. The objectives of the project, according to him, is to produce bankable geosciences information (all set of data). Doing this, he said, would reduce the risk in the sector and also attract competent investors. On his part, the AG Vision contractor, Warwick Crowe, said the project is aimed at gathering enough samples of the mineral resources discovered in the various states. This samples he said would be taken to Canada for a laboratory test to enable them know the quality and quantity of the mineral resources discovered. "This lab test would take like three to four weeks before the results would be ready," he added. Bala Mohammad, a representative of the village, while addressing the audience said for years Kuchiko has been suffering. "No government has ever stood to notice the manual mining we do in this village.
" We are happy that this government is concerned about our wellbeing. We are 100 per cent in support because there is no place that has the resources we have in our place that we do not know. "Our prayer is that the government would not leave the village the way it met it. We are in need of electricity, potable water and a good road. If through this the government provides all this for us, we would be forever grateful."